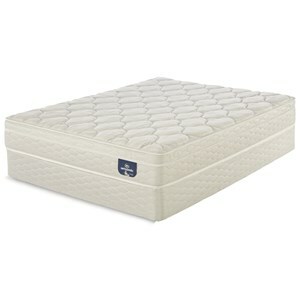 The Annadel Luxury Firm Cal King Luxury Firm Premium Pocketed Coil Mattress and 5" StabL-Base® Low Profile Foundation by Serta at Colder's Furniture and Appliance in the Milwaukee, West Allis, Oak Creek, Delafield, Grafton, and Waukesha, WI area. Product availability may vary. Contact us for the most current availability on this product. 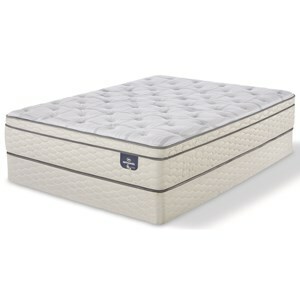 05-751-281 Split Cal King 5" StabL-Base® Low Profile Foundation 2 5"
The Serta Perfect Sleeper Elite Standale Luxury Firm Mattress combines some of Serta's latest comfort technologies with a state-of-the-art steel coil innerspring support system. Individually wrapped steel coils balances body-hugging comfort with outstanding support for your body. The coils are then surrounded by a foam encasement that supports the edge of the mattress giving you full use of the surface. These mattresses are an ideal solution for those who prefer the look and feel of a traditional mattress with the benefits of advanced comfort and support features. With a layer of Cool Action™ Gel Memory Foam to help dissipate heat, you'll be able to get the rest you need. This mattress has a touch of softness at the surface yet a firm support, perfect for a stomach sleeper or if you like a firmer feel to your mattress. The Annadel Luxury Firm collection is a great option if you are looking for Mattresses in the Milwaukee, West Allis, Oak Creek, Delafield, Grafton, and Waukesha, WI area. Browse other items in the Annadel Luxury Firm collection from Colder's Furniture and Appliance in the Milwaukee, West Allis, Oak Creek, Delafield, Grafton, and Waukesha, WI area.